Hercules, the leader in mobile DJ controllers for PC/Mac®, is proud to unveil its new mixing console for computers, the Hercules DJControl Instinct. Available end of June 2012, the DJControl Instinct is designed for anyone with an instinct for mixing, and for everyone dreaming of getting behind the decks to host great parties with their own music and setting the dance floor on fire. Is even more eye-catching, featuring shiny surfaces, and attractive backlighting that really stands out. 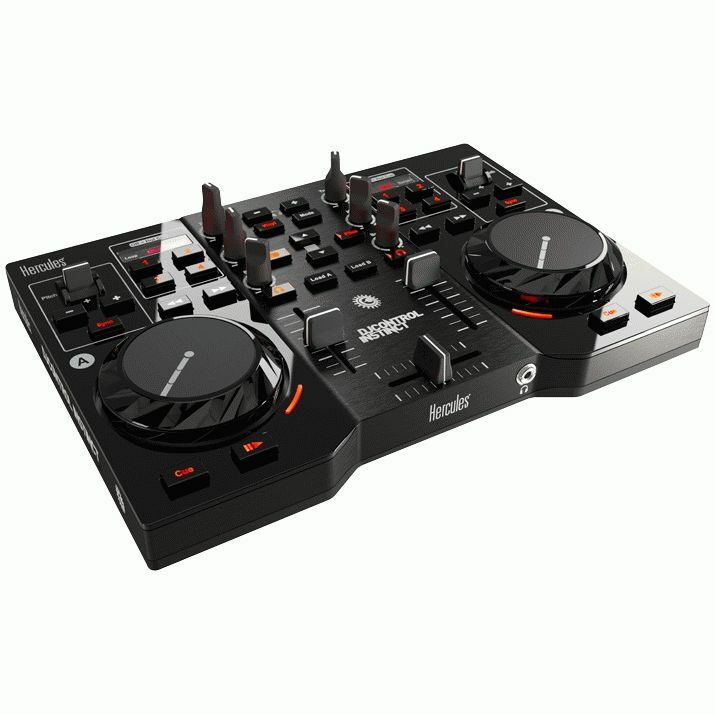 Thanks to its central mixer with a brushed metal texture, which splits up the controller’s surface in relation to the two lacquered deck areas on either side, DJControl Instinct provides handling that is truly instinctive. The bright orange and red backlighting used for its controls allows users to very easily identify where all of the different elements are, even in low-light conditions. In addition to being simple to use, the controller is also powerful: its two pressure-detecting jog wheels let you scratch without any latency, as well as scroll within tracks, and control the Pitch Bend function. DJControl Instinct is portable, weighing in at less than 1 kg, and is just 19 x 26.5 cm in size. What could be better than impromptu parties at the beach, get-togethers with friends and student parties this summer? DJControl Instinct is the only controller in its category to feature built-in audio outputs: two RCA outputs, plus one 3.5 mm stereo mini-jack output. This makes it easy for DJs to play their mix on amplified PA system speakers, on a hi-fi system or on multimedia speakers. The controller and its bundled DJ software, DJUCED™, are a perfect match for one another – you’ll be able to start mixing in just a few minutes. To help those getting started with mixing, DJUCED™ not only instantly displays the beats in music tracks, along with the tracks’ lengths, but also indicates which songs match best for the next track to be played. DJUCED™ even lets users adjust the pitch, or use the auto-sync function, to ensure that transitions between tracks stay on time with the tempo. Perfectly designed for creativity, DJControl Instinct lets users customize mixes with effects, loops, samples and Hot Cue points, and even by using the Step Sequencer. DJUCED™ also lets users save your creations as audio files, so that you can share your mixes with friends.